The ninth annual edition of Florida's Biggest Rock Experience will take place Friday, May 3, Saturday, May 4 and Sunday, May 5 at Metropolitan Park in Jacksonville, Florida and will feature must-see headlining sets from some of the biggest names in rock including Tool, Korn, Rob Zombie, Incubus, The Prodigy, Shinedown and Judas Priest—making their Rockville debut. Rob Halford says, "Judas Priest are primed and ready to unleash new Firepower with full metal fury on the USA again as we are one of the headliners at Welcome To Rockville in Jacksonville, Florida! The Priest is back!" 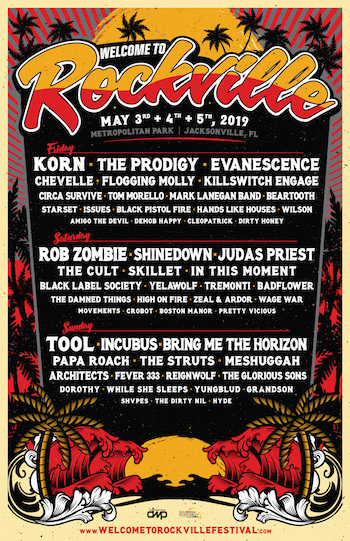 Chris Kilmore of Incubus adds, "We're excited to return to Jacksonville and play at Welcome To Rockville in 2019! There are some great bands on the bill and we can't wait to see our friends in Tool, The Prodigy, as well as many others. See you there!" In addition to performances from top music artists, and various onsite attractions, attendees will also enjoy food and beverage options celebrating local Jacksonville flavors, provided by Southern Hospitality Concessions LLC (DWP's affiliate concessionaire). Selections from the following local and regional restaurants will be available: Brucci's Pizza, Cely's Filipino Cuisine, Chinchilla's Eatz on the Streetz, Dos Vatos Tacos, Grumpy's Homemade Ice Cream, Guanabana Ice Pops, Indochine, Island Noodles, Mama's Food Truck, Mojo's BBQ, Pie Baby Wood Fired Pizza, Safe Harbor Seafood, Sweet Pete's, The Bread and Board, and What's the Catch Fish Tacos, with more to come. Fans 21+ can wash down Welcome To Rockville's over-the-top food offerings with a variety of beverages, including Bud Light, selections from the Caduceus Cellars & Merkin Vineyards Wine Garden (owned by Maynard James Keenan, co-founder of international recording acts Tool, A Perfect Circle, and Puscifer), Heavy Tiki Bar (an oasis filled with killer cocktails and shade), and local craft beer. FYE will be hosting the ultimate fan & artist interactive experiences throughout the festival! FYE is the only place at the festival to get all your favorite band's music — and maybe even get to meet your favorite Welcome To Rockville performer! Check back for updates on artist meet & greet and autograph signing sessions! Welcome To Rockville is produced by Los Angeles-based Danny Wimmer Presents, one of the largest independent producers of destination rock music festivals in the America. DWP events include Louder Than Life, Aftershock, Bourbon & Beyond, Chicago Open Air, Sonic Temple Art + Music Festival, Epicenter Festival and more. They're also the co-creators of Rock On The Range, America's largest and most acclaimed rock festival, which celebrated its 12th and final year in 2018 with 140,000 in attendance.